Is Mystery Object an Orphan Afterglow? Explanation: What is that unusual object? Astronomers can identify most objects that are imaged on the sky, but not all. Pictured above is one that currently defies classification. Attributes of the object include that it has unusual colors, appears to be fading as months go by, and appears to be associated with a distant galaxy. Its discoverers hold hope that they have uncovered the first known orphan afterglow, an explosion that would have been classified as a gamma-ray burst if the gamma-rays were beamed in our direction. Orphan afterglows, if they exist, could have unparalleled brightness, and hence be visible so far away that they yield key information about the early years of our universe. 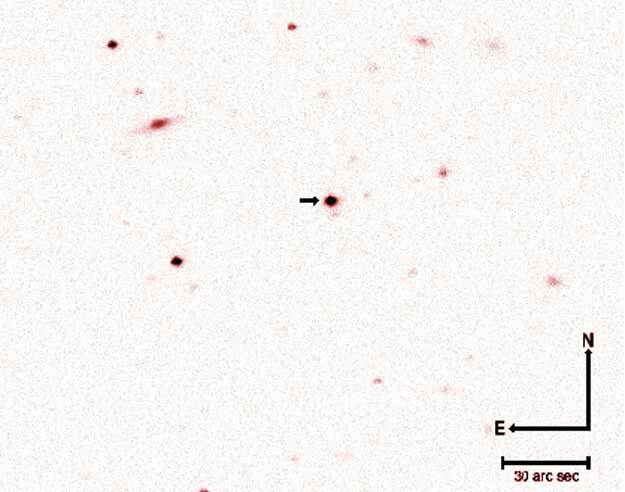 A bit of caution might be merited, however, as the last well-publicized mystery object turned out not to be a new member of the astronomical zoo, but rather an unusual type of quasar. Follow-up observations and analysis over the next year may find more objects like this and/or solve this mystery.